The Legal Services Society (Legal Aid BC) is working with the Healthy Aboriginal Network to create a story about Gladue reports in the form of a graphic novel and video. Under the Criminal Code, people who identify as Aboriginal have Gladue rights. These rights encourage judges to take a restorative justice approach to sentencing that helps both the offender and community heal. The Supreme Court of Canada has confirmed that judges must look at how Indigenous offenders’ lives have been affected by colonialism and systemic racism and must consider sentences other than jail to repair the harm a crime has done. You're invited to watch the focus group short and provide feedback. The videos are made from the rough storyboards, so that after focus group testing and feedback, the story and illustrations can be edited easily and cheaply. After you watch the video, please think about what you liked the most/least and if the story, situation, and characters seemed realistic to you. Please email your feedback to sean@thehealthyaboriginal.net. This year, the Legal Services Society has increased funding available for Gladue reports. A Gladue report helps the judge take into account Gladue rights during sentencing or when setting bail. Legal aid lawyers can request funding for the production of these reports. For more information about legal aid Gladue reports, please contact us at gladue.coordinator@lss.bc.ca. 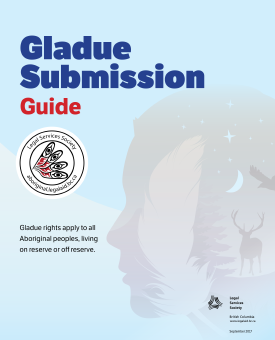 You can learn more about Gladue rights and Gladue reports on the Aboriginal Legal Aid in BC website and from our Gladue publications (scroll down to see them all). We’ve just released three new Aboriginal publications about Gladue rights and First Nations Court in print and online, and two more will be coming later this year. People who identify as Aboriginal have Gladue rights under the Criminal Code as a result of their circumstances (experiences) in Canada. The word Gladue comes from a Supreme Court of Canada case about an Aboriginal woman named Jamie Gladue. In her case, the judge said that the criminal justice system failed Aboriginal people and too many Aboriginal people were being sent to jail. As a result, judges must consider an Aboriginal person’s background as well as the history of Aboriginal people in Canada when Aboriginal people are in court for bail, sentencing, or appeals. To learn more about Gladue rights and First Nations Court, check out these new publications! This fact sheet for Aboriginal peoples explains restorative justice at First Nations Court, how to get into First Nations Court, where they’re located, and what a healing plan is. This infographic poster shows when Gladue is applied at bail and sentencing hearings, and when to get a Gladue report or prepare a Gladue submission.